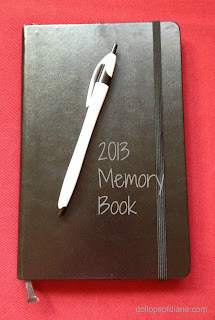 Dollops of Diane: 2013 Memory Book: One Month Down! I read how Smarty Pants Mama made a Memory Box last year for her family and I knew immediately that I wanted to do something similar. Of course, I decided this on 12/31/2012 so I didn't have time to come up with some fancy, awesome box/book. Instead, I decided to just use a notebook that I had laying around for years and no use for. So since January 1st, I've been writing a couple of sentences about what we've been doing each day. I don't embellish what we've done or try to make it sound like we are living the most awesome life each day, I just write what we did. If possible, I try to include little things like what the kids played with, who they played with, and things that they were excited about during the day (since I know these things will all change over the year). So here we are today on January 31st and I'm excited to say that I've got each day of January documented. Now, I may have had to fill in a few days at a time after I forgot to do it a couple of times but hey, no one's perfect! What about you? Do you document your year somehow? It's not too late to start a book like this yourself. After all, who says that it HAS to start in January? !